Welcome to the second installment of yellowHEAD ASO’s App in Focus, where we take a look at all kinds of interesting apps from an app store optimization perspective. This week, our ASO wheels are spinning with Strava, a running and cycling GPS and workout tracker. With consumers continuing to rapidly adopt healthier lifestyles, and turning to their mobile devices to do so, the market for health and fitness apps is one of the fastest growing and most competitive. According to user reviews and our own use of the app, Strava’s app is high quality, comparable to popular competitors like Nike+ Run Club and MapMyRun. While the the app itself may be very good, Strava has not been able to break the top 20 in the Free Health & Fitness category on Google Play and has broken it only twice on iTunes in the last year. An app’s success is dependent on a range of marketing efforts including social media, SEO, paid campaigns, and ASO. Although Strava has an active and engaged social media presence and appears strong in web search, we noticed some untapped app store optimization opportunities. Let’s break it down. Strava’s icon is simple: the brand’s logo over its brand’s orange color. The logo itself is unique and may be recognizable to consumers who follow the brand or are very into the running or cycling world. However, it may be overlooked by users searching for a running or cycling app who don’t know Strava, as there is nothing in the icon that suggests what service it provides. Taking a look at competitors’ icons, we see that most of them use an element that clearly suggests the function of the app, typically a running or cycling silhouette . Even a big name like Under Armour incorporates such figures under its recognizable “UA” logo. To gauge the effectiveness of an icon change, Strava can run A/B tests of variations including ones with a cyclist or runner along with its triangular brand logo. It can also test things like variations in background or logo color. The current background color is unique to the competition and consistent with the brand, but testing color variations doesn’t hurt and can yield some surprising results. Strava uses direct screens from its app with no backgrounds or captions. While most competitors do the same, this is generally not the best ASO practice. Screenshots should be eye-catching and tempt the user to continue scrolling through. One way to do this is overlaying screens from the app over an interesting, colorful background. Another common practice is displaying the shots from the interface on a phone screen, like RunKeeper does below. When doing so, make sure that all of the relevant information on the screens is clear and legible. Including captions and calls-to-action on each screenshot is another good practice. Text should be brief while effectively communicating the app’s main functions and benefits. “Running” and “cycling” individually have high search volumes, but from an ASO perspective, it is more effective to target longer tail keywords rather than single words. 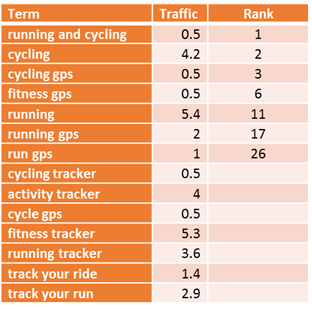 The phrase “running and cycling” together has an average search volume of only 260, while “running and cycling gps” has merely 30. Integrating the phrases “fitness tracker”, “activity tracker”, or “run tracker” in the title should be considered. 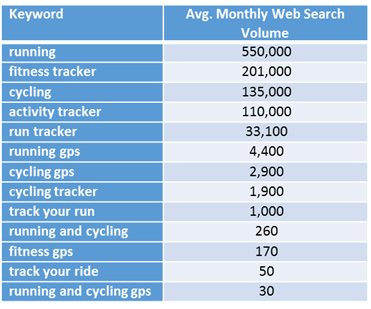 “Running GPS” also has a higher search volume than “cycling gps”; another thing worth considering. are relevant high-traffic keywords that Strava does not rank for and should consider targeting. An optimized iOS title for Strava may be something like: “Strava Cycling & Running GPS and Activity Tracker”. 50 characters long; targets “Running GPS” and “Activity Tracker”; and accurately describes the app. When making changes to the iOS title, it is important to remember to edit the 100-character keyword list to ensure no keywords from the title are not repeated in the keyword list. There is very little to no benefit in targeting a keyword in both places. Strava’s description is well-written and clearly describes its features, but has significant opportunity for keyword targeting. The description currently targets a few keywords including “track your runs”, “activity tracking”, “GPS running watches”, “heart rate monitors”, and “personalized training”. 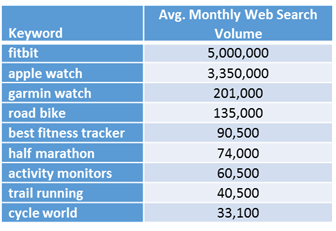 However, all of these terms have pretty low search volumes, with “GPS running watches” topping the list with an average of 1,900 worldwide monthly searches (Google AdWords). Strava delivers a very good product at the level of the biggest names in health and fitness. In order for this to reflect in category rankings, Strava can take steps to improve its ASO across all aspects of its store listings. Testing new icon variations, like ones with a runner or cyclist, may show that these convert better. Of course, preservation of the brand image has to be considered when creating new icons. For screenshots, Strava should create graphics over colorful backgrounds with captivating text to differentiate from the competition and draw more attention. The most significant ASO opportunities are in the textual components. There are a number high volume keywords that are not being targeted in either titles or descriptions. Taking advantage of all of these ASO opportunities while maintaining its other marketing efforts and product quality can give Strava the run it needs to reach the top of the rankings. Stay tuned to our blog for more news and insights from our performance marketing experts! For any questions, comments, or inquiries, feel free to contact us here!